We do lots of laundry in our home! As you can imagine, with eight people in our "blended home", there is at least one load of laundry that could be washed and dried a day. This is in a dire attempt to keep up with the massive amounts of dirty clothes & towels that accumulate. Sometimes, just sometimes, a load gets forgotten about in the dryer...until the next day. Those clothes tend to be a bit WRINKLED! In fact, most of the time, they are not just a "little bit" wrinkled, they are crazy wrinkled! 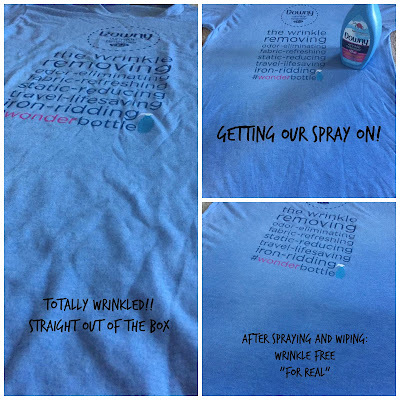 Instead of re-washing the entire load (talk about a waste of water and energy), and heating up a hot iron to press all the wrinkles out of the clothes...I just use a "magic spray", and the wrinkles magically go away! All products for this review/feature were sent free of charge by the company being featured! 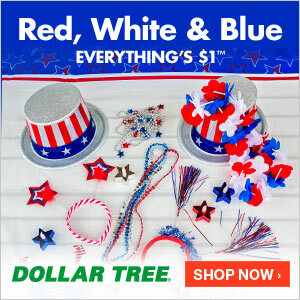 I was not offered any monetary payment for offering my honest opinion about these products. It's a darn shame this stuff doesn't work on the wrinkles of our skin! I'd seriously buy them out of product if they did! Someone needs to invent a spray that instantly removes the wrinkles from our face and body! How cool would that be? But it's pretty awesome how it works on all types of fabric! 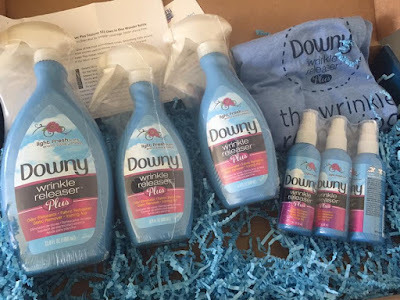 DOWNY created a product that MOM'S EVERYWHERE LOVE!! CHECK OUT THIS BOX full of product we recieved, to give our honest REVIEW of this product! My personal favorite is the "travel size" bottles, because they fit perfectly in the your purse or suitcase, so they can be "on the go" with you. You never know when you might need to work out a wrinkle or two, before a meeting or maybe an "on TV" interview? Ha...those were the days! This product is a GOD SEND for busy families like ours, who just don't have time to spend hours ironing out or steaming out all of the wrinkles in their clothes. It's also a GOD SEND for teenage boys (see the picture above of his dresser, where he has shoved as many tee shirts in as he can) who are learning to be responsible for their own laundry. 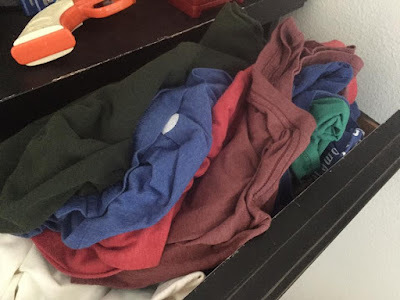 Teenagers, have who have to wash, dry, and then "sorta" fold their clothes...to then shove it into their dresser, to be pulled out and worn to school in the morning...COMPLETELY AND TOTALLY WRINKLED. Despite the fact that they are indeed clean, they look like they we were waded up or like he crawled straight out of bed. The last thing he (or his mommy) wants to do is iron his tee shirt before school! Have a look at the t-shirt that came with our review pack. 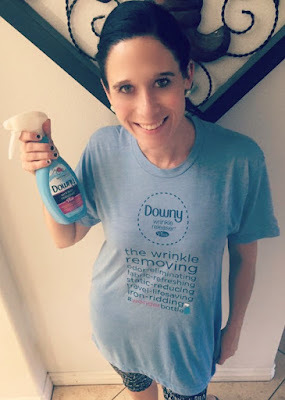 It was obviously totally wrinkled when I pulled it out of the box and after spending a couple minutes spraying it down with the Downy Wrinkle Releaser Plus Spray and pulling the fabric gently with my hands...the shirt, once dry, was almost completely wrinkle free. Want to know why I love it? The shirt smells great (fabric refreshner), it only took a couple minutes to gently pull the wrinkles out, it took no electricity (no iron was used in this process) and we can use it on almost all fabrics. THIS STUFF IS AWESOME and something we use a lot of in this house! Don't believe me? Two years later, and I still love this stuff! 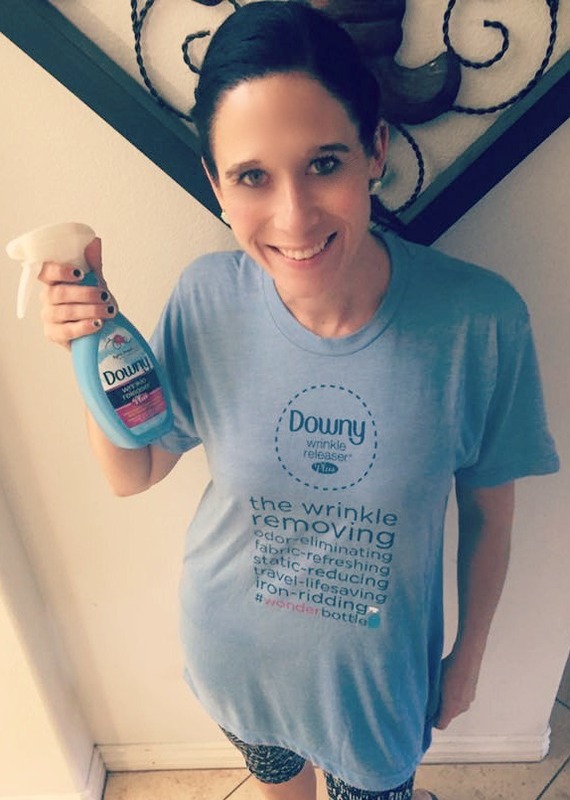 TRY THIS Downy Wrinkle Releaser Plus for your family's wrinkled clothes and see for yourself how well it works, and saves you time & effort! I have a feeling, you're going to love it as much as we do! I was not paid to feature this post! I was not compensated monetarily by posting my opinions about this product. All products were sent free of charge by the company for our review/feature!